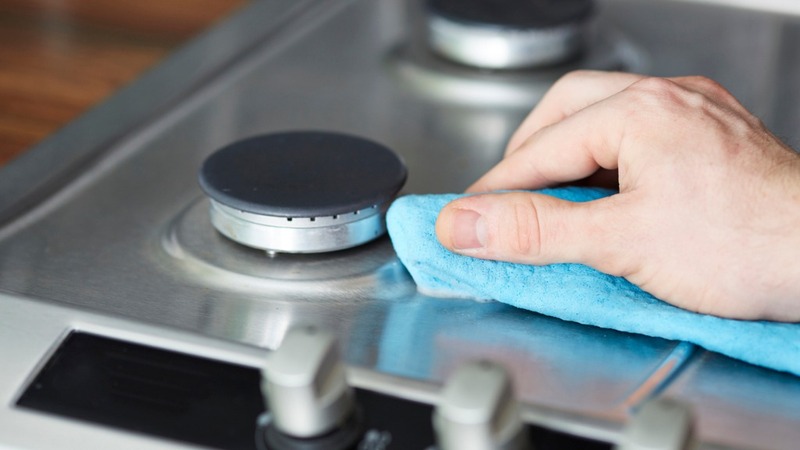 Cleaning a stove top can prove to be a monumental task when you find out that the baked on gunk and stains cannot be removed by just wiping things down. Chances are that if the stove top is used even semi-regularly, you’ll find a dirty buildup of unseemly stains around the burners, on the burner covers, and around them both. This buildup is inevitable, as food always finds its way outside of pots and pans when there is food cooking. The good news is that the burnt on gunk does not have to stay there forever. With a bit of dedicated cleaning, you can help the customer’s stove top return to its former pristine glory. So without further ado, here’s how to clean a stove top. Set aside just 15 to 30 minutes or so of your time to scrub off stove top gunk and you’ll be all set! 1) Gather simple materials. All you need to perform this stove top cleaning, is to have baking soda, paper towels, a soft-bristled brush, dish soap, and hydrogen peroxide at your disposal. Only hydrogen peroxide could prove difficult to find around the house, but a cheap bottle will be available at any pharmacy. You can always message the user before your job to check if they have it! 2) Remove the burner covers. Take the burner covers off so you can access the trapped gunk and stains underneath. The burner covers may need cleaning as well, and if that’s the case, clean them separately before putting them back on the stove top. You can also leave them to soak in warm water to help unstick some of the mess while you clean the rest of the stove. 3) Scrub with soap and water. Get as much gunk off as you can with the traditional method of soap, water, and brush. Most of the big chunks should come off through this step, but there should be more stubborn stains that need further cleaning. 4) Create your stove top cleaner concoction. To clean the more stubborn parts, make your own cleaning solution. Pour half a cup of baking soda into a bowl and gradually add hydrogen peroxide while mixing the two ingredients together. When you’ve created a slightly liquid paste, your homemade stove top cleaner is ready. 5) Scrub, scrub, scrub. Now that you have your cleaning mixture, dab a paper towel or brush into your mixture and start scrubbing. This should instantly work to remove even the most stubborn of gunk and stains. If you still have stains that won’t go away, try pouring the paste onto the spot and waiting 10 minutes before scrubbing. That should loosen up even the most stubborn gunk. When you’re done, the stove top will look shiny, new, and clean! Now you know how to clean a stove top in an expert fashion. With this nifty stove top cleaner mixture, you can always make sure you provide an out of this world experience for your customers. Though it may not seem like much, coming home to a clean stove top when you need to is so relieving and so gratifying. Have a great time cleaning your stove tops and the stove tops of others and thanks for learning how to clean a stove top. Thanks for reading and happy cleaning!